A Rinkya Blog: The Pillows Come to America! Popular JPOP band, The Pillows will perform at Anime Boston on March 22nd! Best known for their music in Gainax's anime oav release, their mascot "Buster-kun" shows up on t-shirts, albums and Kubricks. 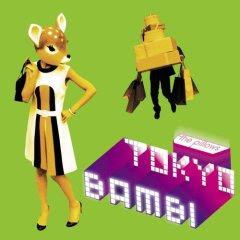 The band's newest single cd/dvd "Tokyo Bambi" was released Jan 31st and can be ordered via Amazon here through Rinkya Stores!